Although a number of mobile apps like GrubHub,CityMint [iTunes link] and SnapFinger have made ordering food for take out or delivery a matter of tapping on a smartphone, diners who choose to sit down generally still rely on a waiter to take their orders. But if startup Storific catches on, these patrons will also have a high-tech alternative. Storific enables customers to browse menus and place orders through an iPhone app. Users check in to the establishment using a table-specific code that the waiter drops off at the beginning of the meal. As they indicate what they want, the items are added to the business’s web-based dashboard. Customers can also send messages to the kitchen and waitstaff that appear on the same dashboard. The France-based startup has launched beta projects in 16 locations throughout France, Italy, Canada and the United States. Co-founder Michael Cohen says that the pilot businesses, which include cafes, restaurants and night clubs, have reported that the app has helped them improve sales by allowing customers to order without waiting for a waiter. He also argues that the app could reduce the number waitstaff needed and make service faster. It’s hard to see how iPhone ordering could become mainstream for restaurants. Since not everyone has an iPhone, which is the only phone the company currently makes an app for, it’s unlikely that a restaurant would make handing out check-in codes a standard process. Another barrier is that ordering from a human is an integral part the experience at most restaurants — especially the high-end restaurants that Storific’s competitor, Tabula Technologies, is targeting. More promising places for an ordering app like Storific might be bars, cafes or sporting events. 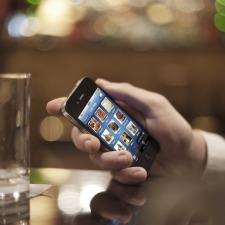 In bars, the app could prevent the frustration that comes with trying to get the attention of a busy bartender. At cafes, people working on computers wouldn’t need to abandon them to buy another coffee. And at sporting events, fans wouldn’t miss critical plays while buying a soda. The Philadelphia Phillies piloted an ordering feature of the MLB’s At Bat app earlier this year. Another market that Storific is smart to be targeting is hotels. It would be easy to leave a check-in code on a card in each room and allow guests to order room service through their iPhones. While some hotels have already begun to make room service a part of their brand-specific apps, hotels that don’t have the resources to invest in branded apps might realistically turn to Storific. The company, which as of now is self-funded, plans to charge establishments a monthly fee for the service after it launches out of beta in mid-January. The fee will be based on the number of tables or number of check-in codes at the establishment (for instance, 100 tables will cost $99 per month).